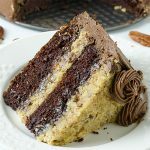 The BEST Chocolate Cake, perfect cake for chocolate lovers! Soft, tasty and very creamy! 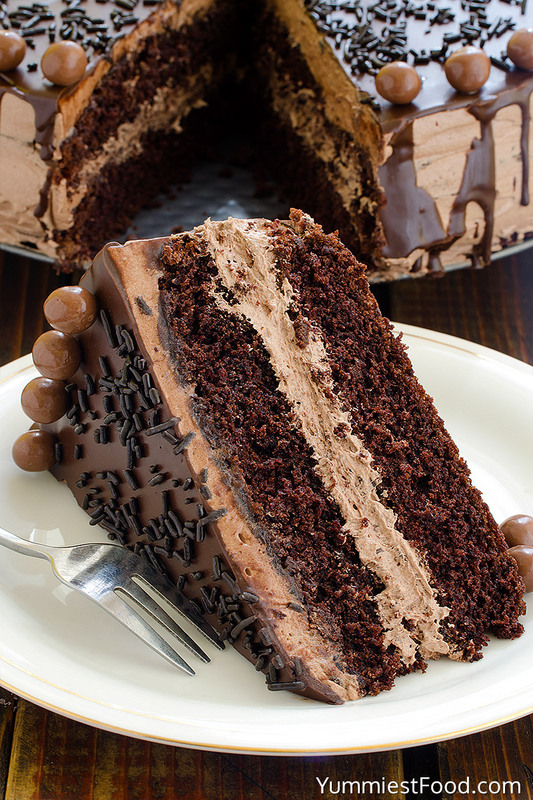 The BEST Chocolate Cake, great combination of chocolate and coffee, so you must try to make it! Chocolate cakes are really delicious but I like them the most when I can make them easy. 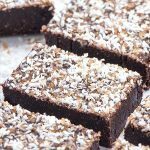 Perfect, soft and so tasty, I make this chocolate cake very often in my kitchen and it is perfect for big parties. 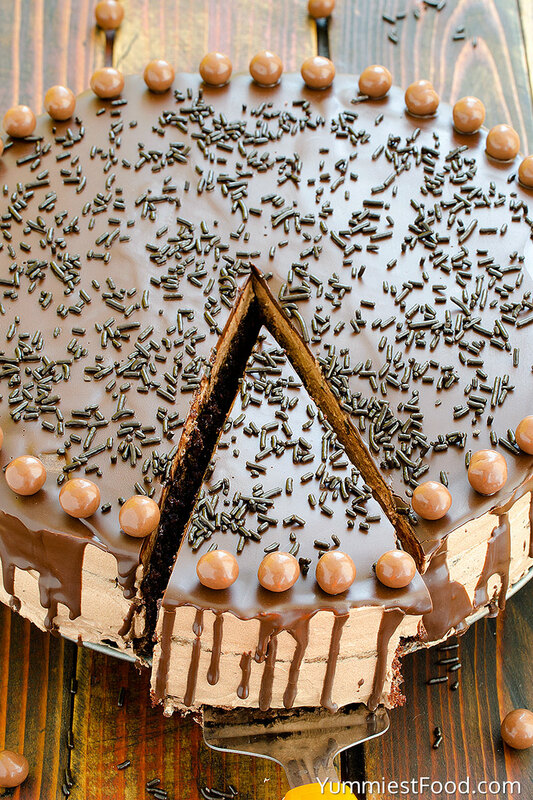 Children or adults, everyone likes this chocolate cake. 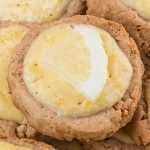 Melts in your mouth, perfectly delicious, creamy, juicy biscuit! My husband and children like chocolate very much, and of course this chocolate cake is favorite one in my family. When I finish my best chocolate cake, I try to decorate it, but my children can’t wait to eat! 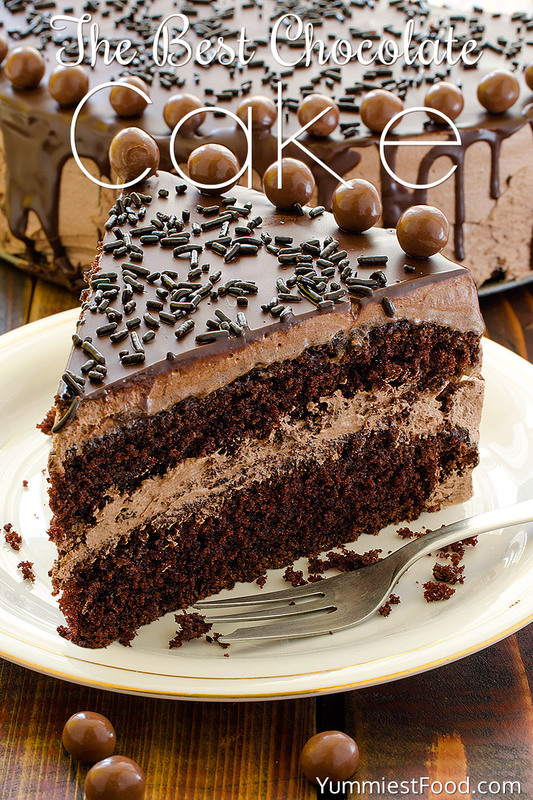 This chocolate cake is real hit for chocolate lover, it is calorific, but very tasty and worth a try. Chocolate cake is very famous in my family and my friends love it too, so there isn’t party without my best chocolate cake. You don’t need too much time to prepare it, and you will finish it very quickly. I will say that this is real chocolate cake, with lots of chocolate, but this cake is so special because includes cup of coffee, which is very good combination! You think that there isn’t anything more chocolate than chocolate, but this chocolate cake is better than anything you tried. 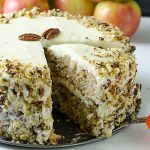 There is opinion that for good cake there must be many expensive ingredients like almonds, hazelnuts or Nutella, that is mistake. I tried so many desserts and sometimes I tried something with lot of expensive ingredients, but their combination wasn’t good and dessert was basic, nothing special. On the other side, I tried many desserts with basic ingredients, but with so good combination, that I couldn’t believe it is so good. It is not the point in your ingredients, the point is the way and combinations. 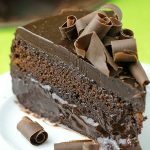 Read carefully my chocolate cake recipe and I am sure that you are going to make most delicious cake you ever made! Butter and flour 2 (8 inch) round cake pans and set aside. In a medium bowl, combine all-purpose flour, cocoa powder, baking powder, baking soda and salt. In the bowl of your mixer, beat butter and sugar, on medium speed for two minutes, until light and fluffy, add eggs one at a time, beating and scraping the sides of the bowl after each, add milk, black coffee and oil and mix until smooth. Spoon batter evenly into prepared pans and bake 10-15 minutes, or until a toothpick inserted in the center comes out clean. Add the melted chocolate chips and beat on medium speed until smooth. Top with 2nd layer and top with frosting and spread the frosting around the sides evenly. *Add melted chocolate in fill. *When barks are cool, add fill and decorate with chocolate crumbs. 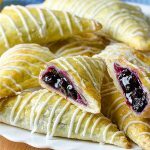 means that you have used all the chocolate chips to make the cream filling, so did you use a ganache to cover the filling on top before decorating? Yes, you are right. I use all the chocolate chips to make the cream filling. 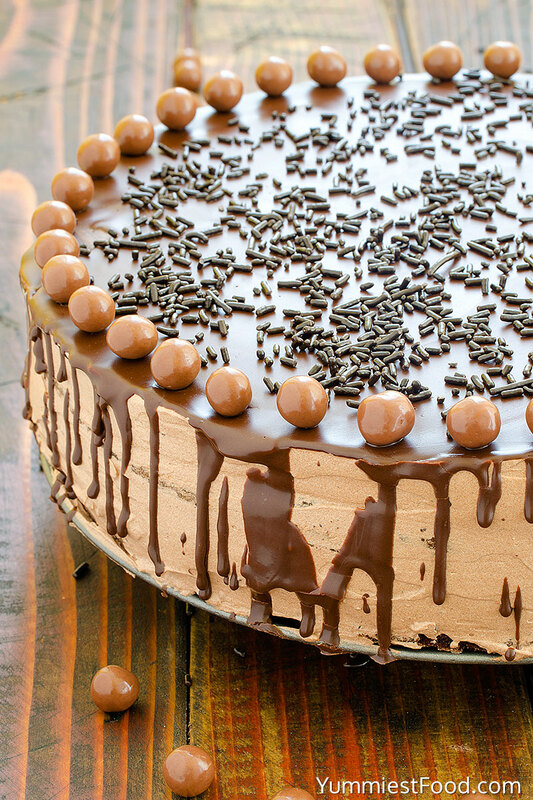 To cover the top of cake you need to melt 1 cup chocolate chips more and then you can decorate with chocolate crumbs. Thank you and hope you will enjoy! This is so confusing. Why isn’t the instructions to make the top in the recipe ?. So you just melt 1 cup of chocolate chips, nothing is added to the chips fior the top layer of chocolate? Hi Amy, Yes you are right there is no instruction because you can use decoration as you wish. Half of it remained in the pan and the was all crumbs. Tastes great though. What about the chocolate layer on top? How do I make that? There are no instructions for how to do that top layer. Sarah, for the top layer you need to melt 1cup chocolate chips in the microwave.. Enjoy! The butter shouldn’t be melted.. Just leave it on room temperature and mix it until it become creamy and soft. Do you have to whip the cream first? Hi Jean! 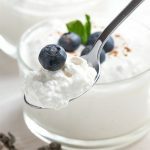 You don’t have to whip the cream, you need to add it slowly and mix with other ingredients until fill become smooth and creamy. Enjoy! Hi ! How long do u bake for, it says 10 minutes. But when I checked at 10 minutes, it wasn’t baked. Hi Samreen! The time might vary depending on the pan you use, and every oven is different, so you can bake it for a few minutes more, or until toothpick inserted into the center comes out clean. Enjoy! What kind of candy balls are those on the rim of the cake? A nice finishing touch. Hi, In this recipe I use “Candy Maltesers” chocolate balls. Thank you and Enjoy! Hi Tonya, you need to use brewed coffee. Enjoy! If you don’t want to use coffee, what can you use to substitute? Hi,Pat ! You could absolutely substitute water….make sure it’s cool or room temperature, though. I promise you won’t even taste the coffee; it just enhances the flavor of the chocolate. I hope you like it! Hi Carmen, you should mix it for 5-6 minutes, until the mixture becomes soft. Enjoy! Instead of using coffee (since we do not dink it), have you ever used expresso powder? Hi Rene, you can use brewed espresso coffee in this recipe. I haven’t used it before, but thank you for sharing some ideas. Enjoy! Hi, Sydney! I use unsalted butter at room temperature in this recipe. Can this recipe be used for cupcakes as well? If so how long would I bake them? Standard 20 min? Thank you!! Hi Katie, I haven’t tried this recipe for cupcakes. Hi Karla, you need to use brewed coffee (2 tbsp coffee+ 1 cup of water). Can you please rewrite the recipe and make it more user friendly. You said to melt chocolate chips for the top shouldnt heavy cream be added as well to make the ganache ? Also 10 minutes is not enough time for the cakes to be fully baked. Please review the baking instructiond and make the appropriate changes. Thank you. Hi Carmela! You need to melt chocolate chips and add in heavy cream and other ingredients, according to the instructions . For the glaze, you need to melt 1 cup chocolate chips in the microwave, also. The time might depending on the pan you use, and every oven is different, so you can bake it for a few minutes more, or until toothpick inserted into the center comes out clean. Thanks for the recipe the cake came out delicious and you are right it melts in your mouth. The cake was so moist that it stuck to the pan so my presentation was not so aesthetic. I greased the pan with, Pam with Flour but it still stuck. Would love to have any suggestions or tips as I never had this issue before? Hi Laura, you can use parchment paper. Good luck and enjoy! Yes Darla, you can taste the coffee in this cake. what are the balls that you use for decoration on top ? Hi!! 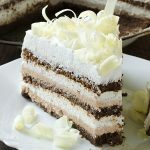 I’m going to do this recipe for my birthday, but i have never done a frosted cake before and i was wondering, where do you keep this kind of cakes? In the fridge? Hi Mar, you can keep it in the fridge. Good luck and enjoy! Does it matter if the chocolate chips are milk or semi sweet? The recipe didn’t specify. Thank you! Hi Cyndi, you can use milk or semi sweet chocolate chips. Enjoy! You’re welcome! 🙂 I’m glad you like it. Hi Kami, when you put the batter in the cake pan, take the pan and thump the pan on the counter a few times. This should hopefully give you a flatter cake. Good luck and Enjoy! Why use oil? Can I use melted margarine or butter? Hi, you need to use oil to grease your pan. You can use melted butter or margarine instead of oil. Good luck! Can this chocolate be covered in fondant or is it too light. Hi Bridget, you can use fondant in this recipe. Good luck and enjoy! Hi i did what your instructions said and out came out to oily. What do you think i did wrong? Hi Laura, I really don’t know. Maybe you have left out an ingredient. I wish you luck the next time! You’re welcome! 🙂 Thank you Shasha, for such a nice comment! I followed your recipe, but the batter came out very thin after I put the cup of milk, coffee and the 1/2 cup of oil…Why? I really don’t know, follow the right instructions next time. Good luck! To make this cake but I don’t eat egg so any substitute for eggs?? Hi Chitra, you can make Chocolate Crazy Cake instead of this. The recipe is on my blog! Good luck and enjoy. Hi , cup of coffee should be hot or room temperature? Hi Shweta, coffee should be on room temperature. Enjoy! Here is a tip: If you don’t like the taste of coffee in a cake, use a cup of hot cocoa instead. Your cake will still be amazingly good. I replace the coffee with hot cocoa. Thank you so much for sharing your recipe with us. The ingredients were perfect and the cake came out really well and moist. This is the first time I tried baking and it came out so yummy ?? I have Semi sweet chocolate chip can I use? Hi Asia, you can use Semi Sweet Chocolate chips. Good luck and enjoy! I made this cake the other day (I used my own icing but will try yours soon!). I baked it for about half an hour (my oven isn’t great) and it came out amazingly! I always coat my pans with a good amount of butter and flour and the cakes slid out with no problems! Thanks, I got lots of compliments! Hi, 10-15 minutes for baking a cake doesn’t sound quite right.. Mine is still in the oven for 15′ and it’s barely baked.. I’d say it need at least 20′ more.. We’ll see..
Hi Mina, I have baked it for 15 minutes, but you can bake it longer or until toothpick inserted in the center comes out clean. I hope you will like the cake! Enjoy! I just tried this for the first time because it looked so good, but the cake would not set up in the oven. I had my suspicion when I added all the liquid and it was very runny that there may be a problem, but after I added the dry ingredients it seemed fine. But even after baking it for almost 45 minutes and it spilling over into my oven it was still all runny in the middle. Any answers? Hi Andrea, did you divide dough in 2 (8 inch) round pan? The time might depending on the pan you use, and every oven is different, so you can bake it for a few minutes more, or until toothpick inserted into the center comes out clean. Good luck! You’re very welcome Kathy​! 🙂 I’m glad that you like the recipe! Hi Ana, I bake each layer separately. Enjoy! Thank you! Can I put chocolate chip in my cake mixture it’s a request from a client. Hi Rowena, Yes you can put chocolate chips in cake mixture if you like. Enjoy! So yummy, The whole family enjoyed it, thank you for taking the time the refine the recipe as you did. There is absolutely no way this cake is done at 15 minutes. I’ve made this cake twice and it takes over 30 minutes to bake, even split into two 9″ round pans. That being said, the cake is delicious. I will reduce the liquid next time.